Technically, this mode of healing encompasses not only stimulating the Meridian system directly, but also utilizes Herbal therapies, structural manipulations, and exercise to maintain health. Actually, Acupuncture is a misnomer given by the Portuguese when they first observed the treatment in China in the 16th century. They were struck by the fact that treatments were given by inserting needles into the body, and afflictions resolved. On this page I will discuss acupuncture/meridian therapy by itself. The other components can be found elsewhere on this site-- but keep in mind that they work together in what has become known as Chinese Medicine, and are separated for discussion only. At this point it would be opportune to point out that other cultures have traditions that incorporate point stimulation such as in India, Persia, South America and Egypt. Also, these cultures used manipulative therapies as well as herbs. The Meridian system is an energetic network of pathways that flow just below the surface of the skin which communicates from the external environment to the internal organs and structures at over 1000 "Acupoints" on the body. This energy works in harmony with the body's circulatory, nervous, muscular, digestive, genitourinary and all other systems of the body. When this vital energy becomes blocked or weakened, an effect in a body system or anatomic location becomes evident. Stimulation of one or a combination of key "Acupoints" on the body may restore harmony to the affected area. This energy flow courses through twelve pairs of meridians or channels that are normally well balanced. If a disruption of the energy flow exists, it can alter the entire system, producing pain or other symptoms in the body. It is the goal of the acupuncturist to restore normalcy to the body's energy balance by utilizing a combination of Acupoints located on these meridians. This is accomplished by a variety of means, the needle is only one. Other methods include Acupressure, laser, electricity, moxa and others. Acupuncture for arthritic knee; Acupoint on foot being warmed with a Moxa stick; Laser stimulation to Acupoint on wrist. With modern technology, we can demonstrate the existence of the Meridian system and the various Acupoints. Below can be seen an infrared scan of the arm showing the Lung and Heart meridian. The path the Meridians take can be compared to a typical chart showing the Meridian locations. Individual acupuncture points can be found precisely with an electronic Acupoint finder, as active Acupoints have lower galvanic skin resistance compared to adjacent non-acupuncture areas, and are consistently found in the same location from person to person. Typical illustration showing location of the Lung and Heart Meridians. Infrared photograph showing Lung and Heart Meridian as predicted by Chinese Medical theory. Furthermore, with an Electro Meridian Imaging system (EMI), each individual Meridian can be read for excesses or deficiencies among the meridians as well as imbalance from left to right sides of the body. From this information the overall state of the Meridian system can be assessed, a course of treatment can be prescribed and various methods applied to restore balance to the body. One would assume that inserting a needle into the skin would be painful since most of us can relate to being stuck with a pin or having a hypodermic injection, and therefore many people are hesitant to try acupuncture. However numerous acupuncture needles can be inserted into the hollow tube of a hypodermic needle, as demonstrated here. Due to the small diameter of the acupuncture needle (about the diameter of a human hair), most people compare the sensation as "less than a mosquito bite"-- if they feel it at all. After a needle is inserted shallowly into a specific Acupoint, a phenomena known as Tehchi occurs when the energy is contacted and the flow of Qi is affected. This sensation is felt as a mild to moderate tingling or heaviness as when a muscle relaxes and tension melts away. However, the other methods of stimulating the Acupoints are equally effective in adjusting the flow of Qi energy. Acupuncture on an arthritic dog. Many critics of Acupuncture claim it is "mind over matter", that you have to "believe" in it for it to work, or even a form of hypnotism. 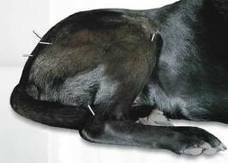 This criticism is totally unfounded as Acupuncture has startling effects in infants and toddlers as well as in Veterinary applications (I don't think dogs and horses have a sophisticated belief system). The effect that Acupuncture has as an anesthetic in surgery further disclaims the skeptics. Even total disbelievers report favorable responses to Acupuncture. I've seen studies that claim Acupuncture is no better than a placebo, as their "sham" acupuncture gets similar results as the real thing. They used a small foam pad stuck to the skin-- in the "real" Acupuncture, the needle penetrates through the foam into the skin, whereas in the "sham" acupuncture the needle only goes into the foam, not the skin (the "patient" doesn't know the difference). I have to smile when I see that the experimenters used actual Acupoints for the "sham" study, because they still put an antenna (needle) over the Acupoint-- the effect was much the same because, just as when you walk near the radio or reach for the TV antenna, the signal becomes clearer, without actually touching the antenna-- just being in close proximity. Good try, but it only demonstrates that the experimenters did not understand the electromagnetic nature of the body or the Meridian system. Representation of the 5 Phases. The ancients lived much closer to the earth and were more observant than we are today. Being so intimate with their environment, they could not help but notice patterns in the cycles of life, and began to interpret the world in light of these patterns. What has become known as the theory of the 5 Phases is an attempt to classify phenomena in terms of five quintessential processes, represented by the emblems of Wood, Fire, Earth, Metal, and Water. Wood is associated with active functions that are in their growing phase. Fire designates functions that reached the peak of activity and are about to begin a decline or resting period. Earth designates balance or neutrality. Metal represents functions in a declining state. Water represents change in the direction of their activity. These 5 Phases also correspond to different emotions, tastes, seasons and so forth, but more importantly, each Meridian corresponds to one of these Phases as do their associated organ systems. 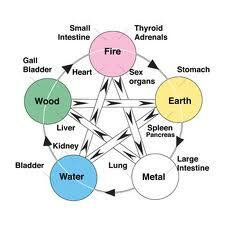 For example, Kidney and Bladder are associated with Water, and Heart with Fire. Joy, panic and hysteria would be Fire while grief would be the declining Phase of Metal. A brief description of the above diagram would be thus: Metal forms Water (condensation of moisture in the air) that nourishes Wood which feeds the Fire that burns to ashes, thus forming Earth. This is the productive cycle and is represented by the outer circle. The controlling cycle skips every other one: Earth controls the Water (pond, dam, creek bank) that puts out the Fire that melts the Metal which can chop Wood which breaks apart the Earth. We intuitively know this-- "feed a cold, starve a fever"-- to ease a fever (Fire) you give fluids (Water), you would not "feed" it by giving it fuel (Wood). Another example is when you are angry (Gall Bladder: "that galls me", which is Wood), you take a few deep breaths (Lung, which is Metal) to calm down. Makes sense, when you think about it. The 5 Phase approach to Acupuncture uses these insights to gain a better picture of the overall energetic state of the patient. There are many factors in your life that influence your Health, and this approach takes that into account in affecting a treatment rather than the Western Symptom based approach that does not often look for the cause of one's suffering.